The characters in this story were like real people for me. An interesting and absorbing read! Imani knows exactly what she wants as her big bat mitzvah gift: to find her birth parents. She loves her family and her Jewish community in Baltimore, but she has always wondered where she came from, especially since she’s black and almost everyone she knows is white. Then her mom’s grandmother–Imani’s great-grandma Anna–passes away, and Imani discovers an old journal among her books. It’s Anna’s diary from 1941, the year she was twelve and fled Nazi-occupied Luxembourg alone, sent by her parents to seek refuge in Brooklyn, New York. Anna’s diary records her journey to America and her new life with an adoptive family of her own. And as Imani reads the diary, she begins to see her family, and her place in it, in a whole new way. The Length of a String, written by Elissa Brent Weissman was published by Dial Books for Young Readers in 2018. I felt so close to the characters of Imani and Anna that I felt sad, disappointed and excited right along with them as I read the story. I’ve always thought that researching your own family is a wonderful way to learn about history, and this novel showed me it’s true. I enjoyed the realistic way the author showed relationships between characters, especially Imani and her mom. I haven’t come across many contemporary stories about girls with a Jewish upbringing, so that was also interesting. All my life I’ve shared with you. Before we were born, we shared Mama’s belly, splitting the resources so equally that we weighed the exact same amount at birth. 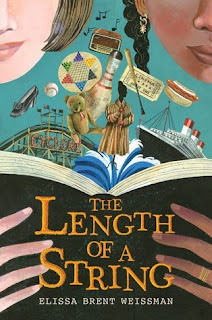 This is an excellent mentor text if you’re trying to weave together stories from two different time periods, or if you want to include a series of letters in your novel. I also really enjoyed the writing style and careful use of details. Technology is integrated into the story with limits and as a research tool. I ran my hand over the old paper until my eyes stopped on a familiar word. A name: Anna. It was at the bottom of the page on the right, the way you’d sign a letter or a diary. My fingers jumped back as though the ink were hot. This would be an interesting read aloud to kick off a family history project or to encourage discussion about war, the Holocaust, identity and family. Thinking about real life events from the perspective of how it affects families made this work of fiction seem quite real. There are details about the Jewish faith, as the main character is preparing for her bat mitzvah. I got a sudden pang of nervousness, like a pinprick in my side. I could tell Mom knew something about Grandma Anna’s family, and I didn’t want to know what it was. Not yet. Check out more great middle grade reads on Marvelous Middle Grade Monday, hosted by writer & book blogger, Greg Pattridge. This book sounds wonderful! Just from reading this review, I already want to know what will happen to Imani and Anna! Thanks so much for the review! You're welcome! I really enjoyed this book and I hope you will too. This sounds like such an engaging and heartfelt story. The cover and your review hooked me right in. So many great themes. Thanks for sharing. Yes, this book does make you think, but it's also a fun read! This sounds like a wonderful book for children and adults to read! I enjoyed your 'If you're a writer' and 'If you're a teacher' analyses. Thank you for sharing. Wow. This one sounds terrific! It would make a good mentor text. I will be checking this book out. Thanks so much for telling me about it. I hadn't heard of it. I hope you enjoy it, Rosi! This sounds like a fantastic story. I love the adoption connection with her grandma. As an adoptive mom, this sounds like one I want to read. Thanks. Yes, and this one is interesting because of the different cultural backgrounds. It makes you think about the assumptions you make about others. Several elements in this story grabbed my attention. The grandmother's diary, the two different time periods and a girl wondering about her roots. I like how the Imani finds her place without searching. That's a twist on many adoption stories. Our daughter just found two of her birth sisters this year and it has given her so much understanding about herself. Oh, that's so interesting! I've been thinking about my own family history and this book makes me want to explore it more. Welcome back to MMGM, and thank you so much for this recommendation! It sounds like an amazing book, and very relevant. Thank you, Suzanne! I have missed MMGM and I'm glad to be back. Such a great way to find good books to read! I appreciate all the quotes you've shared with us. Also, I'm revising a novel with a series of letters in it, so I'll keep your advice in mind.